With the disappearance of Malaysia Airlines Flight MH370 still remaining a mystery, the entire world still holds its collective breath. Several questions still remain unanswered; What happened to the plane? What happened to its 239 passengers? Are they still alive or are they all dead? Was this an act of terrorism? A mechanical failure? Human factor or simply an act of God? Is there something supernatural about this? Is the plane going to be found and if so, when? Of course, with an incident like this, one would also expect a lot of conspiracy theories. Whenever a mystery of this magnitude occur, there’s always this temptation to turn such an event into an X Files-style investigation. In this article, we’ll be looking at the real facts surrounding the Malaysia Airlines Missing Flight MH370, we’ll try to answer some of the questions you might have, please continue to check back as we’ll continue to update this when we know more. • Malaysia Airlines flight 370 departed from Kuala Lumpur International Airport at 12.41 am (local time) on Saturday en route to Beijing on March 8, Weather conditions were favourable. • It was expected that the Boeing 777-200 aircraft’s scheduled flight path would take it over stretches of the South China Sea and Vietnam on a journey of about 2,700 miles (4,350 kilometres). • MH370 was expected to land in Beijing at 6:30 a.m. MYT (5:30 p.m. ET) the same day. • According to Malaysia Airlines Authorities, Subang Air Traffic Control lost contact with MH370 at 1:30 a.m. MYT (12:30 a.m. ET) over the sea somewhere between Malaysia and Vietnam, their military radar last detected the plane at 2:40 a.m. MYT (1:40 a.m. ET) near Pulau Perak, a small rocky island in the Malacca Straits. • It was reported on the 11th March 2014, that the Malaysia military noted that the plane had inexplicably diverted hundreds of miles west from its original flight path. • 4 days after, on Mar. 15, Malaysia’s Prime Minister Najib Razak also announced that MH370′s communications were intentionally disabled, an evidence suggesting foul play, after the discovery, the focus shifted to the crew and passengers. • There were a total of 239 people, including 12 crew members, on board. 227 passengers came from 14 different nationalities. Five of them are below the age of 5, including 2 infants. • An Austin-based technology company, Freescale Semiconductor has 20 employees (12 from Malaysia, 8 from China) on flight MH370. • It was also reported that four passengers with valid bookings for the flight never checked-in, according to a Malaysia Airlines statement on March 11. • The two Iranian passengers, Pouria Nourmohammadi Mehrdad and Seyed Mohammed Reza Delavar, were using stolen passports. • Reza, aged 29, was using the passport of Italian Luigi Maraldi, aged 37. • Nourmohammadi, aged 19, was using the passport of Austrian Christian Kozel, aged 30. The two Europeans lost their passports in Thailand in 2013. Thailand is a well-known hub for counterfeit passports. International police (Interpol) logged the passports as stolen in their database, but it was not checked prior to the flight. The two Iranians, however, are not believed to have terrorist links. • The all-Malaysian crew was headed by Capt. Zaharie Ahmad Shah, 53, a veteran with 18,365 flying hours who had been with Malaysia Airlines since 1981. First Officer Fariq Ab Hamid, 27, joined the airline in 2007 and had 2763 hours of flying experience. Fariq and another pilot have drawn some flak for bringing in two women aboard their aircraft to sit in the cockpit for a flight from Phuket, Thailand, to Kuala Lumpur sometime ago, that notwithstanding, Both pilots have been described as respectable, community-minded people. • The Boeing 777-200ER was fully loaded with fuel carrying up to eight hours worth of fuel. 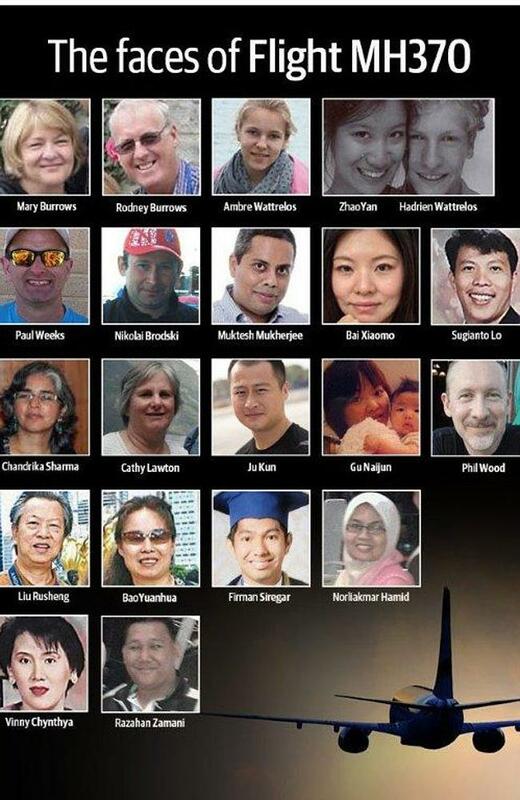 • The last transmission from MH370’s Aircraft Communication Addressing and Reporting System (ACARS) was at 1.07 am when it was deliberately turned off. • It was also discovered that the transponder was deliberately shut down at 1.21 am. • From the cockpit, “All right, good night” were the last words that were delivered and it was after ACARS was disabled. • Just about roughly 1.30 am, air traffic controllers situated in Subang, outside Kuala Lumpur reported that it could no longer detect MH370, placing its last coordinates at 06 55 15n 103 34 43e. • The Malaysian Military radar shows the missing jet climbed to 45,000 ft — higher than a Boeing 777’s approved limit — turning sharply to the west before it descended unevenly to 23,000 ft on getting to the island of Penang. It then climbed back to 35,000 ft, heading northwest towards the Indian Ocean. • According to the airline, radar tracking detected MH370 above the tiny island Pulau Perak in the Strait of Malacca just about 2.40 am. • MH370’s last ping was sent at 8.11am — seven hours and 31 minutes after takeoff. • Chinese seismologists recorded a “seafloor event” and an “earthquake wave” in waters between Malaysia and Vietnam at 2.55 am local time on March 8. According to the group from China’s University of Science and Technology, the “catastrophic plunge” was consistent with the plunge of a plane. • Overnight, the number of countries involved in the search has expanded from 14 to 25, including countries like Pakistan, Bangladesh, India, China, Myanmar, Laos, Vietnam, Thailand, Kazakhstan, Uzbekistan, Kyrgyzstan, Turkmenistan, Indonesia and Australia. • No country or individual has owned up to knowing the whereabouts of MH370. — March 8, 12:41 a.m. The Aeroplane carrying 239 passengers departs Kuala Lumpur Malaysia heading to Beijing China. — 1:07 a.m. ACARS transmits its regular, half-hourly data report about the jet’s engines and other data to the airline. — 1:19 a.m. Someone, that is believed to be the co-pilot, makes the final voice communication from the cockpit, saying “All right, good night” to air-traffic controllers. — 1:20 a.m. The transponder shuts down, removing the plane’s identification on commercial radar systems. — 1:37 a.m. An ACARS data transmission is due but never sent any sign or signal. — 2:14 a.m. The plane is last seen on military radar. — 8:11 a.m. A satellite records a faint, final “ping” from the disabled ACARS system. A broad arc of the jet’s possible location stretches from Kazakhstan into the southern Indian Ocean. — About 8:40 a.m. The estimated time for the jet’s fuel supply to finish.